Dow past 16,000 - How long will the rally last? I'm usually pretty pessimistic when it comes to long, upward trends like the one we are seeing today regarding the US markets. Pretty much since the beginning of October it has been a good bull run, gains of more than a 1,000 points! The Fed stimulus is working! But in a scenario like this you have to ask yourself whether it's time to be cautious when it comes to buying stocks, and rather wait until the market slows down a bit in order to buy on a dip. Of course it mostly all depends on fundamentals. During the government shutdown the markets didn't really react to it, Ben Bernanke's successor Yellen will probably maintain the same policy, and now the new deal with Iran lifts the markets even further. As the old saying goes; what goes up must eventually come down, but is now that time to think about it? 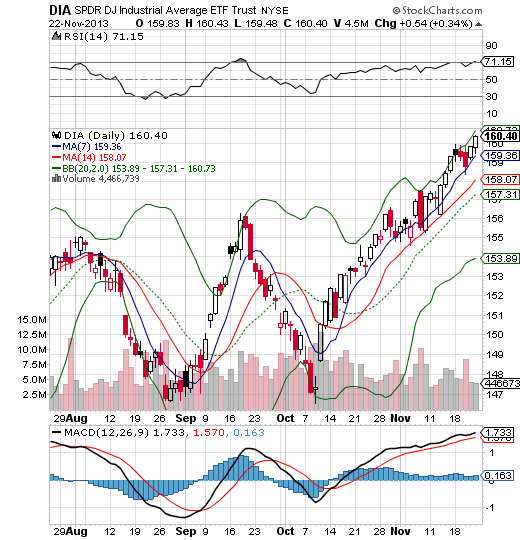 Slowly, but surely the RSI crawls into 'overbought' territory (70) on the chart below. The last time the RSI was in overbought territory (around mid September) the Dow plummeted about 800 points! The markets do what the markets do best, and that's being unpredictable. There are a few signals, however, that the current bull rally may last a lot longer than previously anticipated. Back in the beginning of November I was one of those who were under the assumption that the rally was not going to last this long. That soon gold and the VIX were the indices to keep your eyes on again, but it looks like optimism won over fear. Better consumer spending in October should've been one of the first signals, but I kept in mind the government bond buying program. Seriously, this whole time the US economy is injected with money from the government, and tapering is not going to happen soon. Isn't this an indication that the overall US economy isn't as sound as people like it to believe? This whole bull run might be a short term upward trend toward 16,500 area in December, where after we can expect a minor pullback, largely due to the fact that buyers are taking profits, and then we're all aboard for the ride up again. Historically this happened many times before, and this time I'm jumping on the gravy train! Stocks I'm mainly bullish about are the financials. As long as the gold, oil and the VIX index stay relatively low (which may be great buying opportunities! !, think of VXX! ), we can expect to see the Dow Jones Index go up even further, at least until the beginning of next year! (provided the US dollar index remains around 80). After the Q4 earnings reports however we need to be cautious, Fed tapering is lurking around the corner again - and who knows - perhaps another government shutdown?